Reporting Day: 20th August 2013 Recently, we came out with our analysis of Rule-X against single day fall of NIFTY(NIFTY Mayhem and Rule-X). We have also provided Portfolio Builder tool to validate the performance against historical data. In this article we have covered single month performance (July 2013) for complete review of APS/Rule-X. Our performance benchmark is NIFTY. NIFTY has historically returned decent profits in the long term (NIFTY Historical Performance), so, if our strategy is performing better than NIFTY it will also yield decent returns (or better than NIFTY). Professional fund managers also measure the effectiveness of investment strategy against such benchmark. Any extra percentage gain (or save in case of loss) against benchmark is called Alpha. If a strategy can generate overall (portfolio wide) alpha then it is considered a good strategy. We have taken investment period 1st July 2013 to 31st July 2013 and valuation has been done on 20th August 2013 (End of the day). During this period NIFTY has lost value by 8.43%. At the same time if an investor would have followed just Rule-X triggers (on daily basis) then such investors would have lost just 2.76%. APS which is a combination of three rules Rule-A, Rule-D, & Rule-X and advocates only weekly trading has made loss of 2.56%. Following is the graphical representation of the same. It is evident that both kinds of investors have been successful in generating alpha. Coming down to more microscopic view of the trades recorded during the same phase. Legends: Trigger Day: Day on which Rule-X suggested to buy. Enter Price: End of the day price on trigger day. Last Trade Day: If it is blank it means position is continuing. Otherwise Rule-X has suggested to sell out the position. Last Trade Price: If 'Last Trade Day' is blank it means the price on analysis day (20th August 2013) else it is the price on the day Rule-X suggested to sell off. NIFTY Start Price: NIFTY price on the day when corresponding stock had buy signal by Rule-X NIFTY End Price: NIFTY price on the 'Last Trade Day'. Rule-X PL: Percentage profit loss due to Rule-X recommendation for corresponding stock. NIFTY PL: During the same period of time (when Rule-X had held the stock) percentage profit/loss in NIFTY. Has Alpha: If Rule-X PL is greater than NIFTY PL then true else false. Hence, APS investors have lost 2.56% only while NIFTY during the same period has lost 8.43%. This means APS has generated 5.87% 'Alpha'. Conclusion:Rule-X and APS both are generating significant Alpha. It means they are capable of outperforming the benchmark (NIFTY) in the long term. NIFTY itself is returning decent profits (NIFTY Historical Return) in the long run. 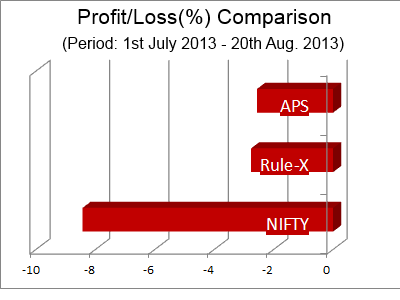 So, APS and Rule-X which are outperforming NIFTY will also return decent profits in the long run.